1. How long does FrostyBowlz® stay cold? 2. Do dogs and cat really like cold water? Many of our customers have reported that their pets preferred the cooler water served from their FrostyBowlz®. Every pet is unique; some might prefer cooler water and others might not. There is plenty of evidence that pets do prefer cooler water and will drink more preventing many diseases caused by dehydration. 3. How do I return my items? If you purchased your items from the www.frostybowlz.com website, you may view our return policy by clicking here . If you purchased your items from a retailer, you will need to return your items to that retailer as their return policy might differ from ours. 4. How do I know the FrostyCore™ is non-toxic? The FrostyCore™ is filled with distilled water and a commonly found non-toxic super absorbent. These materials are also tested upon delivery to our U.S.-based warehouse for toxicity before being released to the public. 5. Can I use the bowl without the FrostyCore™? Of course! The heavy-gauge stainless steel bowl has a non-skid bottom, and is perfect for everyday watering and feeding without the FrostyCore.™ You will find that the bowl is among the highest-quality feeding dishes available on the market. 6. Can I use the bowl to serve my pet’s food? Of course! Many of our customers use FrostyBowlz to keep their pet’s perishable wet food cool all day. Just read many of the comments posted on our website. 7. How long do I freeze the FrostyCore™? You should freeze your FrostyCore™ a minimum of 8 hours for optimal performance. 8. My FrostyCore™ doesn’t fit tightly under the bowl. It’s important to make sure you freeze your FrostyCore™ on a flat shelf, with the bottom facing down. If frozen sideways, the liquid inside might expand unevenly during the freezing process. The FrostyCore™ was designed to maximize the cooling properties for the longest period of time. In some cases, your FrostyCore™ might have minor expansion points, which is perfectly normal. However, the bowl, plate and FrostyCore™ are designed to fit loosely because of this. This will not affect the performance of FrostyBowlz® in any way. 9. Can I put the bowl and plate in the dishwasher? Both the bowl and plate are dishwasher safe at any temperature. 10. Can I scrub the bowl and plate with a scouring pad? Scrubbing your FrostyBowlz® bowl and plate with a scouring pad or heavy bristled brush will not harm the bowl, but might create micro scratches on the surface. Although this will not affect the performance of the bowl or plate, we have found that the bowl and plate are easily cleaned with a soft sponge and warm, soapy water. Alternatively, you can wash the bowl and plate in the dishwasher. 11. Can I put the FrostyCore™ in the dishwasher? No, the FrostyCore™ is not dishwasher safe. 12. Should I wash the FrostyCore™? Washing your FrostyCore™ is not necessary unless you see noticeable debris. If you wish to wash the FrostyCore,™ use a soft sponge or washcloth and warm, soapy water. 13. Do you have other sizes available? FrostyBowlz is currently offered in three different sizes, 14 ounce, 28 ounce and 48 ounce. Other sizes are under development. 14. What size FrostyBowlz® should I buy? A lot of research is available regarding the amount of water pets should consume each day. It always depends on the pet and the type of food they consume. A good rule of thumb for daily water intake is ½ to 1 ounce of water per pound of body weight. 15. Will my FrostyBowlz® rust if left outdoors? FrostyBowlz® is made of the highest quality stainless steel. Although nothing is truly rust proof, with proper care, your FrostyBowlz® should remain rust free for many years. 16. Can my pet get into the FrostyCore™? The FrostyCore™ is made of a thick, durable plastic. When used properly, the FrostyCore™ is safely encased between the stainless steel bowl and plate. We do not recommend using the FrostyCore™ without the bowl and plate. 17. What do I do if my pet eats the FrostyCore™? Although the freezable gel inside the FrostyCore™ is non-toxic, we recommend that you consult with your veterinarian in the unlikely event your dog ingests either the plastic or the gel . 18. Can I put my FrostyBowlz® it direct sunlight? On warm days, your dog should always have access to shade. When possible, you should place FrostyBowlz® in an area that will have shade the entire day. 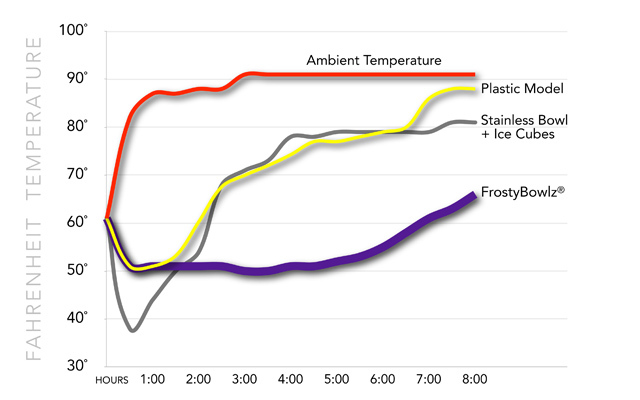 However, FrostyBowlz® does still work well in direct sunlight, it just does not keep the water cool as long. 19. How does the ant barrier work? The unique design for FrostyBowlz® includes the bowl and plate. You can fill the “moat” between the bowl and plate with a small amount of water to create a water barrier that many ants will not be able to cross. It’s important to point out there are many species of ants depending on your geographic region. Some species can be quite large and the barrier created by FrostyBowlz® might not be large enough to keep those out. 20. What is your return policy? We stand behind our unconditional 100% SATISFACTION GUARUNTEE and for any reason you wish to return your item please contact us by email at info@frostybowlz.com indicating your desire to return the product along with a short description for the reason. We will issue you an RMA# and you can ship the item back. Please note we DO NOT pay for the return shipping charges but we will refund your entire order including the original shipping costs. If it’s determined your product is defective, please send pictures of the problem.